Comrade Shehu Sani, the senator representing Kaduna Central, has said that the much acclaimed integrity of President Muhammadu Buhari is not enough as a leadership virtue for tackling the various challenges confronting Nigeria. The senator, who was speaking at the 80th posthumous birthday event of legal luminary and activist, Chief Gani Fawehinmi on Sunday, said though president is a man of integrity, one man integrity cannot salvage Nigeria from corruption. He said: “You cannot lead a country because of the integrity of one person. The integrity of one person is not enough to sustain a nation. You need a chariot that is driven by set of principles, set of revolutionary ideas. “We have a president who is a man of integrity, but integrity is not enough for leadership. Leadership requires all other virtues and qualities. The lawmaker urged Nigerians never to vote for people based on political affiliation but to look out for individuals with qualities that would best serve the progress of Nigeria. He added that Nigeria is not yet at the promised land as those who have misled the country are yet again presenting themselves to the people. “Our country is sick, the republic is dying. Our people are dying. Violence, bloodshed, killing, mass murder is becoming an emblem of our democracy today. “It is unfortunate that the Moses of freedom, those who made sacrifices to free our country from military colonialism have taken back seat. “We are out of PDP misrule but we will be deceiving ourselves to say we are in the promised land. We are not in the promised land. We must stand firm in the defense of democracy. The politically stealing elites are not yet prepared. Nigeria’s political reality is about personal interest. 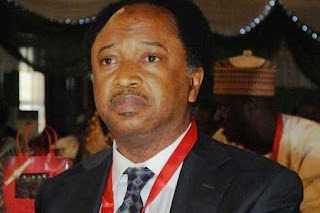 “Those who destroyed our country in the past are very much present as born agains,” Sani said.